Newly minted Mayor Eric Garcetti’s first day in office began with a face-to-face meeting Monday with a panel of business leaders to discuss issues ranging from expanding business resource centers to a plan to rid the city of its business gross receipts tax. Notably missing among the group were some of the bigger and more influential business groups, such as the Los Angeles Area Chamber of Commerce, the Valley Industry & Commerce Associations and other types of “umbrella” organizations. The mayor’s spokesman, Yusef Robb, said the goal of the economic roundtable was to understand the needs of business chambers working at the “Main Street” level. Instead of the larger organizations, the group consisted of directors and presidents from a dozen or so chambers representing such areas as San Pedro, Venice Beach, Century City, Hollywood and Encino, as well as a group representing Hispanic chambers. The gesture left an impression on some attendees. “You’re the first mayor we’ve met on his first day in office!” Steven Kasten, president of the Lincoln Heights Chamber of Commerce, said as the meeting wrapped up. As Garcetti jotted notes and fielded suggestions from the chamber representatives, he also began outlining defined policy direction for his first few months in office – at least in the area of economic development. Chief on his list is a strong push to eliminate the city's gross receipts tax on businesses, which has given the city the unwelcome distinction of having the highest business tax among Los Angeles County’s 88 cities, Garcetti said. As a councilman, he participated in creating a plan for phasing out the gross receipts tax, which is based on a company’s earnings before expenses are paid out, rather than its profit, as is the case with many state and federal taxes. Some city leaders, who Garcetti called “well-intentioned budget minders,” have expressed concern that getting rid of the tax could cut into the amount of revenue for city services. In order to gain momentum for the effort, Garcetti said he would need the chambers’ help to come up with examples of how the gross receipts tax has hurt businesses and caused others to leave the city. “I want to humanize this,” he said. No longer able to introduce legislation himself, the new mayor will need to rally the support of members of the City Council, which would have to do the leg work of putting together a law to phase out the tax. The council Garcetti will be interacting with underwent a dramatic shift this Tuesday with the installation of six new members. The council also appointed a president, with incumbent Herb Wesson hoping to be re-elected by his colleagues. Garcetti’s hour-long roundtable also included a discussion of making city services more accessible and known to businesses, especially smaller ones that do not normally interact with City Hall. Garcetti said he wants to build on the city's six business resource centers, which are modeled after “one-stop-shop” centers that bring together myriad “hodge-podge” city re­sources into one location for job seekers and families. The business-oriented centers would help companies find business loans, provide mentorship and give technical assistance. If expanding the reach and number of the centers is not possible, Garcetti said the city could also partner with local chambers that already provide such services. The panel also discussed Los Angeles’ “business team,” city staff who work with city businesses, with Garcetti saying he wants to not only increase their ranks, but also ensure its members are experts in various industries or geographic regions. 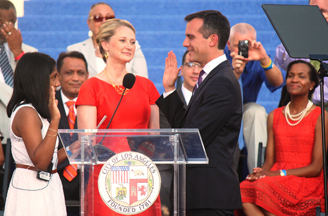 Garcetti also promised a more cooperative approach toward businesses. He said government entities are often more focused on regulating industries, which he said is still important, but he also wants to make sure it also focuses on helping businesses succeed. Other “to-dos” Garcetti said he took away from the meeting were to create a panel of city officials from different departments to discuss how their services can be better coordinated; directing police and fire chiefs to think about how public safety can partner with businesses; and researching ways to simplify the city’s contract bidding applications. Garcetti also touched on a need to focus on the immigration law that is making its way through Congress as a possible driver of the local economy.